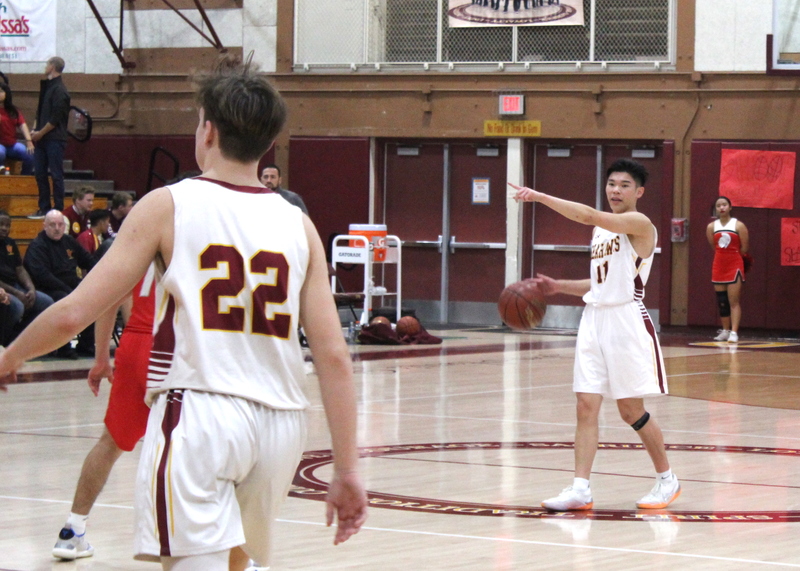 CARSON NGUYEN points the way for Ocean View as the Seahawks defended their lead in the Golden West League last Friday, defeating Garden Grove (Tribune photo). 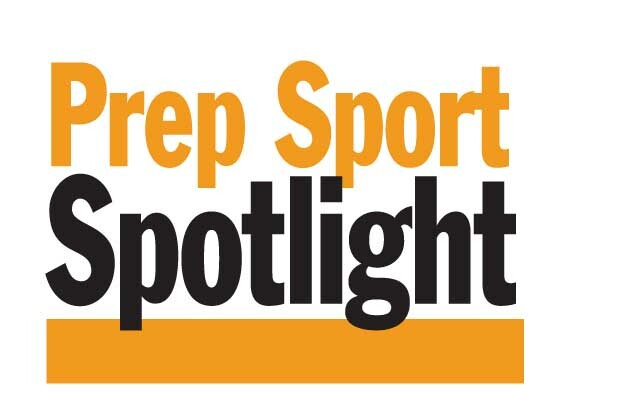 It’s the very last week of league play for area high school basketball teams. The brackets for the CIF-SS playoffs will be announced on Sunday at noon at www.cifss.org. 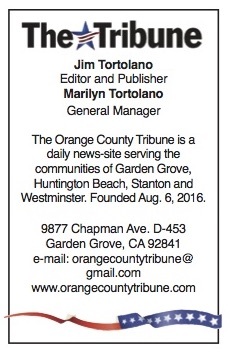 Here’s a look at how the league races stand for teams serving The Tribune’s coverage area of Garden Grove, Huntington Beach, Westminster and Stanton. 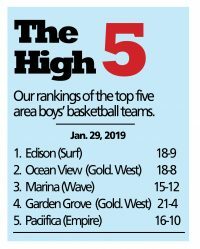 Empire League boys: Pacifica (16-10 overall, 2-6 in league) is finishing fifth, but can still make the playoffs, as the Mariners are ranked 16th in their division. Cypress has the EL title. Empire League girls:Like the boys, the Mariner girls are in fifth in the league (2-6), but are 6-19 overall and will finish their season on Friday. Kennedy has won the crown. Garden Grove boys: It’s a real race as four teams still have a shot at the title. Santiago and La Quinta are tied for first at 6-2, with Bolsa Grande and Loara in third at 5-3. The big game tonight (Tuesday) will put Santiago at Loara. The league schedule concludes on Thursday. Garden Grove girls:The GGL is a three-team race with Santiago (7-1) on top, followed by Rancho Alamitos and La Quinta at 6-2. Tonight’s La Quinta-Rancho game will see one of those teams knocked out of the title chase, but the question may be moot as Santiago plays last place Loara in a game that will likely allow the Cavaliers to grab no worse than a tie for the championship. Golden West boys:This race is probably over; Ocean View (8-0) clinched no worse than a tie after defeating Garden Grove (6-2) last Friday. Following them is Westminster (4-4). Golden West girls:Segerstrom (8-0) has won it, with Westminster and Garden Grove (each 5-3) tied for third. Orange League boys:Magnolia (1-7) is finishing fifth. The league crown is up for grabs between Savanna and Century (7-1). They’ll play on Thursday. Orange League girls:Magnolia (2-5) is fifth in the league. Anaheim (8-0) has a two-game lead over Katella (6-2) with two games to play. San Joaquin League boys:Orangewood (1-7) is in fourth place (of five teams) and is 15-13 overall. San Joaquin League girls:Orangewood (6-1) is in second place behind Fairmont Prep (8-0) and will meet the Patriots on Wednesday in Anaheim. Surf League boys:Edison (3-2 in league) and Corona del Mar (3-2) are tied for first, with Newport Harbor and Los Alamitos in third at 2-3. Newport visits CDM on Wednesday and Edison is at Los Al that night, so everything is still undecided. Surf League girls:Huntington Beach (4-1) is in the lead, followed by Los Alamitos and Corona del Mar next at 3-2. Edison brings up the rear. But if CDM and Edison each win tonight (Tuesday), that will create a three-way tie for first at 4-2. Wave League boys: Marina and Laguna Beach are tied for first at 4-1, with Fountain Valley (2-3) and Huntington Beach (0-5) following. The Breakers will visit the Vikings Wednesday in a contest for the title. Wave League girls: Marina (6-0) has the title locked up. Westminster High’s wrestling team did pretty well in the CIF-SS dual meet championships on Saturday. The Lions not only served as hosts for the event, but advanced to the semifinals in Division 5. They crushed Vista del Lago 70-9 in the first round and then defeated Quartz Hill 51-28 in the quarterfinals before finally losing 40-31 to South Torrance in the semis. The final winter sports polls before the CIF-SS playoffs start next week were released on Monday and here’s how local teams were mentioned. Division 4AA: Garden Grove is ninth. Division 4A: Santiago is fifth. Division 5: Los Amigos is fifth, Garden Grove is eighth and Santiago is 10th. Division 6: Los Amigos is 10th.